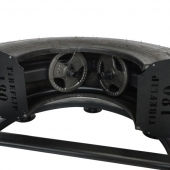 TireFlip 180 Functional Training System Now Available! 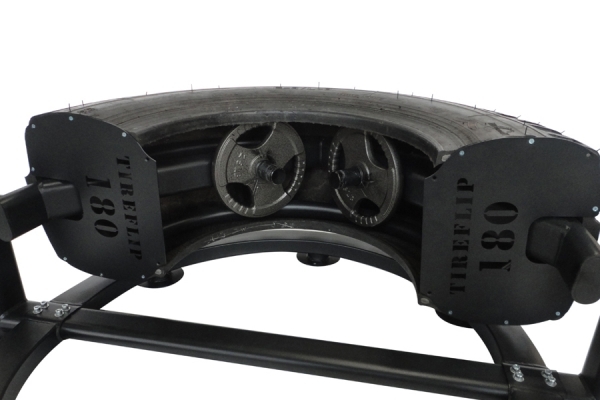 The TireFlip 180 – The TireFlip 180 from The Abs Company is a commercial-rated functional training tool featuring a half tractor tire mounted on a 180-degree rotating pivot for the purpose of performing tire flip exercises by oneself or with a partner in a stationary location. Tire training combines total-body strength, raw power, cardio and agility all in one workout. The start-to-finish motion of flipping a tire uses your whole body providing a dynamic combination of muscles for a great workout that taxes both the muscles and aerobic system. It's one of the best, and most physically demanding, strength and conditioning workouts you can do. Since tires come in all sizes and weights, tire training can add a new dimension to any fitness conditioning program, regardless of age, gender, athletic ability, or fitness conditioning level. Tire Training has been around for years and is undeniably a great way to get fit. But there's a big problem – tractor tires take up a lot of room and it's often unsafe to have a huge tire moving around the gym. Tire training requires a long and wide lane so that large rubber tires can be flipped repeatedly end-over-end from the starting point of the training zone to the finish line on the other end. Then, the exerciser moves around to the opposite side of the tire, reverses direction, and does it all over again until the body gives out. 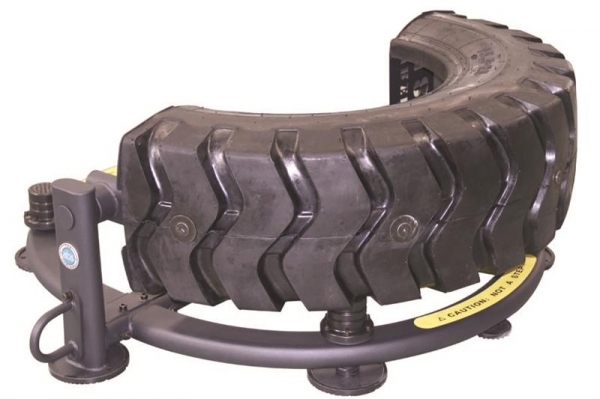 Recycled tractor tires can weigh hundreds of pounds, making them a hazard to equipment, mirrors, and other exercisers who may happen to get in their way when mishandled, rolled out of control, or flipped off-balance in a direction not intended by the athlete. Since several tires of different diameters, width, and weight are needed to cater to those of various skill and strength levels, gym owners will also find themselves faced with a literal mountain of ugly junk yard tires taking up valuable real estate against the wall or in a corner of the gym better suited for other cross-training equipment (not to mention being an eyesore). Some gyms and crossfit boxes will take the tires to the pavement and use parking lots and commercial delivery lanes as training zones. Landlords and neighboring tenants cringe at the thought of runaway tires hitting parked cars, not to mention the potential liability of outdoor training with group fitness athletes running around in auto traffic zones. Not all gym facilities are willing to take on the challenges of making tire flipping accessible and available to their members. 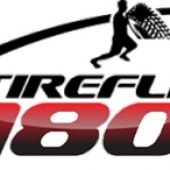 The TIREFLIP 180 solves these problems, and does a whole lot more! The TireFlip 180 comes in 2 sizes: the standard TireFlip 180 and the heavier TireFlip 180XL. Taking up only 4' x 5', the space saving design requires only 20 square feet of dedicated floor space (about the same size as the average bench press) to give your boot camp members and personal training clients an exciting and effective workout like they’ve never experienced before. 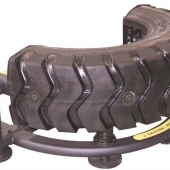 Plus, each model allows you the ability to add free weight resistance to give you a broader training range so there is no longer a need to have multiple tires in your facility to accommodate all users. 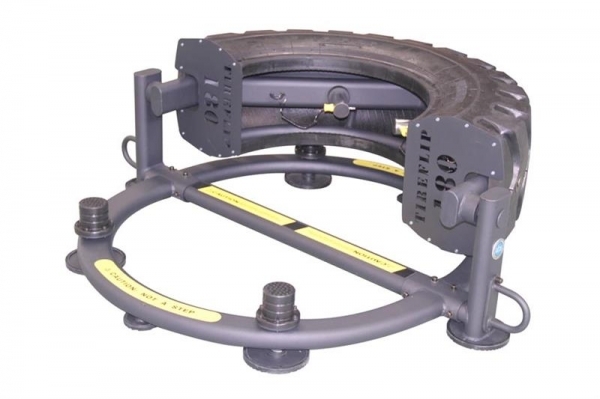 For solo tire flipping, partner training, circuit training, or small group training the TireFlip 180 is the perfect functional training device to deliver challenging, effective, and fun workouts in a safe, space-saving exercise zone. 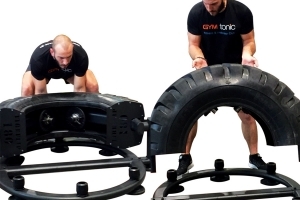 Revolutionize your tire training! Training range: 160 to 240 lbs. Starting tire weight: 160 lbs. 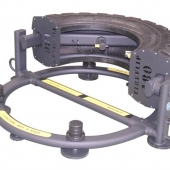 Additional plate loading weight: Up to 80 lbs. NOTE: It is recommended to remove any additional weight plates from the inside posts when performing strikes and slams with sledgehammers or macebells to avoid plate cracking caused by shock or impact through rubber tire wall.